How can I effectively build student engagement in reading, writing, and speaking in my middle school ELA class? When I began my Masters Program in the New Literacies and Global Learning program, I had been teaching middle school ELA for four years. This was just when I was beginning to start feeling comfortable as an ELA teacher but at the same time knew I still had a lot more to learn and room to grow. During my time teaching before I began this program, I had developed my three-part vision for middle school ELA: that students master the skills of reading, writing, and speaking. My class needs to be a place where: 1) students are learning to critically analyze texts, but also enjoy reading texts and appreciate reading skills as valuable to their everyday lives; 2) see writing as a tool that when artfully mastered, can give them power and autonomy to express themselves in a number of ways; and 3) be able to speak professionally and scholarly about any number of topics. Yet the tough reality is that there are many challenges to reaching this vision. Many of my students are still in the late stages of "learning to read" rather than fully "reading to learn"; many are in that phase of life when reading is no longer enjoyable or as fun as it was in elementary school; and most have not received robust writing or speaking instruction in years because these skills are not assessed on state tests and therefore deprioritized by their previous teachers. Basically, I was beginning to realize that getting students engaged in these three pillars of English Language Arts was going to be a challenge. I enrolled in this program with the goal of determining how I could successfully achieve this three-part vision for my middle English Language Arts classes. This synthesis chronicles my and my students' growth in achieving this vision. I have learned that if teachers thoughtfully and carefully put structures and systems in place to intentionally engage students in these three areas, that vision -- creating students who are critical readers and who enjoy reading, who can write powerfully and sophisticatedly, and who can engage in provocative and scholarly discussions--- can certainly be met. 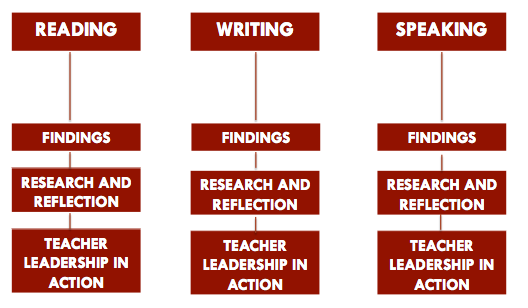 The three pages of this site outline my findings in the three areas of my vision: reading, writing, and speaking. To see how these findings relate to Common Core Standards, click here. Each page also consists of two additional sections that I believe highlight two other huge areas of my learning in this program: Research and Reflection and Teacher Leadership in Action. Research and Reflection: The NLGL program uses a project-based inquiry approach to learning: students pose compelling questions, gather and analyze information, creatively synthesize that information, critically evaluate and revise it, and then publish and share it with others. I have been asked many times in my classes throughout this program to conduct research in my classroom using this PBI process. I cannot downplay the effect this cycle of research and reflection has vastly improved my classroom instruction and contributed to my growth as a teacher. This program has taught me to take a lot more risks in my classroom and not to be afraid to try something new; and then to analyze the success of that new technique and adjust instruction accordingly. For each category of learning on my site, I tried to highlight a few ways that I used research and reflection to improve my instruction in that particular category. Teacher Leadership in Action: Our program culminates with a "Teachers as Leaders" class in which we learn how to take what we have developed in our course studies and lead others in our school and in the education system to do the same. My development as a leader was accelerated when during my second year in this program, I became an instructional coach at my school in charge of mentoring eleven middle school ELA and Social Studies teachers. A huge part of my growth in this program has been the teacher leadership skills I have developed through sharing what I have learned in my courses with other teachers. Each site page also includes a section on how I developed my leadership abilities in regards to that particular category. My name is Courtney Samuelson, and I am a middle school English Language Arts teacher in Durham, North Carolina. I am enrolled in the Masters in Education Program in Middle Grades English Language Arts at North Carolina State University's New Literacies and Global Learning Program. I was an English major in college, but I have always wanted to be a teacher. My passions are reading, learning, discussing education, and hanging out with children at the wonderful ages of 11-14. Click the "Reading" Tab above to begin. Happy reading! NOTE: All students and their parents have signed release forms giving permission for their photographs to be published on this website.